Our Lady of Lourdes Cathedral is the seat of the Bishop of Hoima and the largest church in the whole diocese. 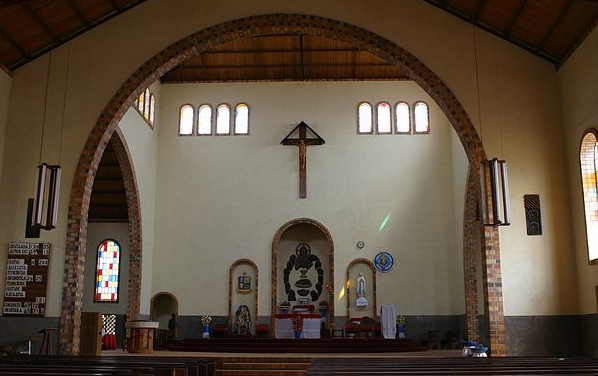 Bujumbura Parish was began in 1900, by the White Fathers (Missionaries of Africa). The Church was dedicated to Our Lady of Lourdes, whose Feast Day is 11th, February. In the 1940s the current Church was built and expanded by two White Fathers (nowadays called the Missionaries of Africa) Pere Court-Martin and Pere Lord (Lordes), who were working at Bujumbura Parish. On 9th, Aug, 1965 the Church of Bujumbura Parish was elevated to status of Cathedral when Hoima became Diocese with Bishop Cipriano B. Kihangire as founding Bishop of Hoima. As Hoima Diocese was marking its Silver Jubilee (25 years) since it began (1965-1990) Bishop Albert Edward Baharagate announced two major projects for Hoima Diocese: (a) the first Diocesan Synod, (b) the renovation of Cathedral by Brother Max Gmur (MoAfr). And so Bishop Edward Baharagate began the work of renovating the Cathedral Church: it was at the time of Hoima Synod which was held on 29th, April – 6th May 1990. At the end of May 1990, some three weeks after the conclusion of the first Hoima Diocese Synod, Rome announced the appointment of a new Coadjutor Bishop for Hoima Diocese, Bishop-elect Deogratias Byabazaire. Bishop Deogratias Byabazaire was ordained Coadjutor Bishop of Hoima Diocese on 23rd, Aug, 1990. He became The Ordinary on 9th March 1991, taking over full responsibility of Pastoral Leadership of the Diocese and thus also responsibility of finishing the ongoing renovations of Bujumbura Cathedral. These renovations were finished 1992 and celebrations were led by new Bishop Deogratias Byabazaire in 1992. Hoima Diocese is now preparing for celebrations of 50 years since it began 1965-2015.